Just lately I have been finding that riding a scooter for a few miles is too tiring to be all the fun it should be, so I have taken to using a bicycle for these intermediate to long distances. Now with a bicycle being a machine, it will give you about four times as many miles for each calorie burned, so for actually getting somewhere and arriving in a state of non-exhaustion, it makes a lot of sense, and explains why there are probably many thousands of bikes in use for each scooter in the world. But before you wonder why I, Jeffrey the Barak, the notorious champion of the scooter, am defecting to the dark side, I am not actually doing so. I am simply reconsidering what each vehicle is most suited for. For long distance scooting out on the roads, then it has to be said that a large-wheeled footbike of some description is going to get the job done better. For the urban commute, then a smaller-wheeled folding adult scooter is ideal. But for the long haul without getting all sweaty and tired, then even a footbike-class scooter has to take second place to any reasonably lightweight bike, as long as you can stand the pain of the saddle, and I am still not sure I can. But I have the ever-present need to scoot. The simple pleasure of standing on a wheeled platform and pushing off to glide is what scooting is all about. Having temporarily emptied the stable of any and all scooters, I have to buy at least one, just to get my kicks. 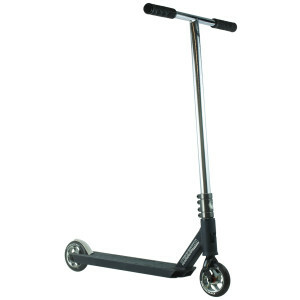 I am in the position of having owned almost all types of scooter except for one glaring exception, the small urethane wheeled type that appeared in the late Nineties in the form of the original Razor. Now I am no fan of Razors, and I particularly dislike the wobbly folding mechanisms and the clattering racket of sound that follows you down the street, and of course I think that tiny urethane scooter tires are practically useless for asphalt roads, uneven sidewalk pavements etc. These wheels are okay on skates, where you can just lift your leg and step over the pitfalls, but unless you are able and willing to jump with your scooter, they are a problem with two wheels and a frame. 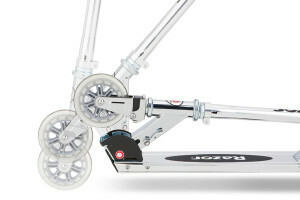 However it has occurred to me that I will most likely be getting my scooter fix on hardwood or smooth concrete, and therefore I can now look at small wheels and a small portable scooter to just grab and ride figure eights on when the need for a scoot comes to mind. And It must live in the cupboard under the stairs, which can take a KickBike or road bike with the front wheel off, but is getting crowded, so a compact scooter is best. And so I recently began to explore the hitherto overlooked world of pro-scooters, also known as freestyle scooters or stunt scooters. Pro-scooters are big business and they are designed for the skate park. A typical rider is more likely to do a dangerous trick than to simply scoot from point A to point B, and so these things are designed for hard landings and they are built like tanks. However they can also simply be ridden, and the strong construction and absence of any folding mechanism makes them very smooth and silent on a smooth solid floor. In fact one of the things people do with these scooters to demonstrate the quality of the build is the drop test, in which the scooter is dropped onto its wheels to produce a pleasing rattle-free ringing sound, which shows that it is “dialed-in”, meaning well-built. Doing this with a commuter scooter such as a Xootr, or a Razor A5, will make the birds fly out of the trees in a state of alarm, but silence and quality come at a steep price, and these diminutive little pieces of precise engineering can cost from $250 to $500 for a decent example. This would buy almost any commuter or footbike and you would seem to get more for the dollar with a larger scooter, but those larger vehicles would never stand up to any of the forces that the predominantly teenage, male, pro-scooter users subject their scooters to. Wheel sizes are growing in this segment. 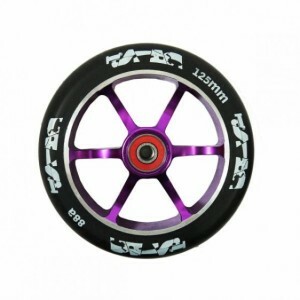 They used to have a total diameter of 100mm or smaller, but now 110mm is common and 125mm is starting to appear as a popular option. 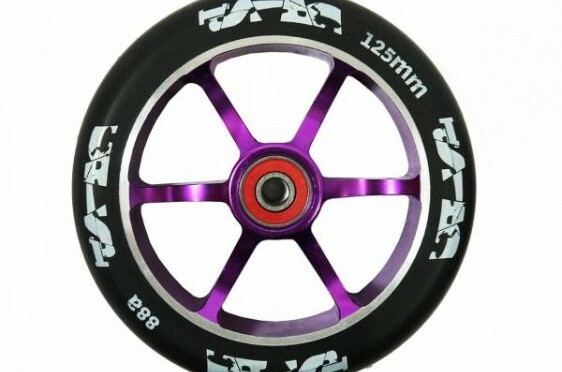 But remember these are skate wheels, made of urethane, and therefore deadly slippery on any damp or wet surface. If I was intending to continue to scoot down the road, which typically has traps and obstacles deeper and larger than the radius of these wheels, I would not be writing about these scooters in the first place. My only experience on urethane has been the Xootr. It is not something I want to repeat on the street, despite all the glowing reviews about scooters such as the Oxelo Town 9 and the Crisp Big Wheel, but that old Xootr MG ran smoothly in the garage and inside the house, well away from ruts, twigs, cracks and damp patches, and these surfaces are now my area of intent for my scooter fix. Let me clearly say that I have no intention to ever do any kind of trick or stunt, but for smooth floor circles, figure-eights and other meditative adult moves, the well-built, silent-gliding pro-scooter has a lot of appeal. However there is a very big downside, and that is the bar height. When these young gentlemen do their acrobatics, they go in with bent knees and bent forward at the waist, and then they lift their scooters up, decks or bars spinning in circles, and this is very difficult to achieve with a high bar. So typically when a grown man such as myself, five feet seven inches tall, stands on the deck of a pro-scooter, the bars are at thigh hight, and the last thing I need to be doing on a scooter at my age and with my flexibility and back issues, is bending down like that. Madd MGP VX3, typical low bar height. Some pro-scooter bars are taller however, and reach the hips. But the ideal bar grip position for a slowly cruising adult is shoulder width apart and at a height between the waist and hips, so this a problem. Bars are measured within themselves, so you see the descriptions online and they say something like 22” X 23”, and you have to assume it means 22” wide and 23” tall, and that the bottom of the bar is clamped to the headset and is about six inches above the deck. It is pretty much impossible to imagine where this will place the bars, so you really have to find a scooter shop, (and there are only a few in the entire country), and try them out. Online descriptions focus on everything except what is important to me, the height of the bars measured from the deck, or from the ground with the deck height also revealed. 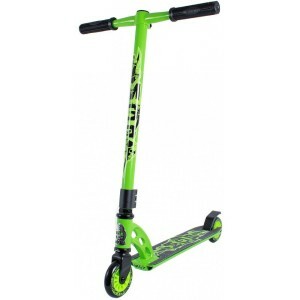 But assuming you can find high enough bars to reach above your hips and do not intend to hit the asphalt or the broken sidewalks of the city, the pro-scooter, with its good bearings (usually no worse than ABEC7 and often much better) will provide some smooth glides in a compact package. Realistically though, the bars are never high enough on pro-scooters. If your intended use is to slowly and carefully scoot along in a forward direction, you have to be able to stand up straight and not have your arms straining to reach the bars. If you are for example, five feet seven inches tall, like me, then that means you need bars that come up almost three feet above the deck. This is not a feature of any pro-scooter at any price. With no tricks planned, is it worth it to drop $300 on a bombproof pro-scooter when a Razor model A is less than $30 and will still get you across the hardwood floor? Probably not. And there is no reason you cannot use an adult commuter scooter on that same flooring and enjoy the ability to stand up straight. Jeffrey the Barak has owned many different scooters, but at the time of writing has sold every one of them and is wondering what to get next. Bite the checkbook and get an Oxelo Town 9 . . .
It’s interesting figuring out the right set of wheels given requirements, constraints and budget. Have you considered the Razor RDS dirt scooter for $130? I bought the black label version. It is built solid, but the headset pitted on me in no time. I wasn’t riding on smooth surfaces though. I like the slick Innova tires I found to replace the knobby ones. Rubber pneumatic tires are wider and safer when road gets rough or wet. When I compare my RDS to my Atom which I bought later, I always pick the Atom for sidewalks. The RDS wheelbase and footboard are too short for easy relaxed cruising. To go fast & safe I need two v-brakes with handy levers. Also, the small wheels force me to keep an eye on the sidewalk rather than looking around. If you keep to areas familiar to you and you might need to ride over bumpy chip-seal paving surface and/or storm drains, go for the RDS (red) or the Black Label version. It’s the best pneumatic small wheel scooter around for the money. Phase Two is the pro version approaching $300. Oh, the Sidewalker Atom is $359 which would burst your budget! Thanks for the comments Rich-Rally. The Dirt Scooters discussed in David Jones’ article have as you know evolved from freestyle scooters, which in turn evolved from the compact foldable Razor scooter. Most people only know about this class of scooter and were unaware of scooters prior to 2000. The Atom on the other hand is a descendent of the larger and much more substantially framed European 12 inch scooters that go back decades. In discussion, and I refer here to the Let’s Kick Scoot forum and all of its experienced scooterers, it seems to be a consensus that pneumatic tires smaller than 12.5 inches are generally not very good. So the Dirt Scooter is an in-betweener that is mostly like a freestyle scooter, but can go off the concrete onto firm dirt, whereas your Atom is for riding along the road without doing tricks and covering some distance. Great post Jeffery! We for one are thrilled scooters are making a comeback. A green way to get around that gets more people outside and moving around? No complaints here! Everything you wrote is fascinating, especially as you are still mulling over your purchase. My comment is to add information about the Town 9 as compared to a Xootr. I prefer that 2-wheeled vehicles have at least one handbrake and at minimum, a handbrake and a stomp brake. That requirement limits my recommendations (of sorts) to a go-ped Know Ped (with a small litany of flaws), the Xootr (my family’s preference is the Venus), and the European Oxelo Town 9, which is the only small urban scooter I now ride. There is no similarity between a Xootr (any model) and an Oxelo Town 9. Although I’ve ridden Xootrs for years, I’ve always tempered my recommendations to others. Hitting a seedpod during an otherwise happy roll can totally destabilize a Xootr. The Town 9 rides *nothing* like the Xootr. I’ve been riding mine, for example, this past week in Savannah, which is largely flat ground littered with twigs, seeds, and occasional lifted bricks. Two years ago we were here on Xootrs and had to give up riding them through some of the most beautiful neighborhoods because Xootrs could not handle nature’s flotsam and jetsam. Fourteen months ago, a non-scooter accident caused me to go lame; so lame that at times, I could not walk a block without extreme pain. At present, I cannot put 100% pressure on a slightly bent left leg *BUT* I can scoot around on my Town 9 as though I was in perfect physical condition. Note that everyone, including me, recommends foot switching when scooting. Unfortunately, currently I can only push with one leg — and you know what? I don’t miss foot switching. That is a HUGE difference between riding on a Xootr and a Town 9. OK, healthy people like my husband (who has had a nasty fall on a Xootr) can go full speed on a Town 9 feeling almost as secure as he does on a 12-inch scooter, but with far less effort. The Town 9’s handlebar doesn’t wiggle and it can fold within 2-seconds. The Town 9 is the *only* scooter that I’d recommend for park tours where the tourists have never before tried a scooter. OK – yes, I’m long winded because I want to make it really clear that the Town 9, introduced last year, is in a class by itself. I do believe I am the first and only person to have scooted the entire length of the Kowloon Prominade (as well as the first person who has done 2 fast laps around the Pyramid at the Louvre in Paris…….but that’s another story!!!) simply because no one else has thought of it! So, having established these two benchmarks, I can say, without fear of contradiction, that scooting is the way to get around while traveling and enjoying new cities, and those slow plodding PEDESTRIANS are naught but impediments to our mobility, and footsore victims of their own ignorance! Hah! hard to avoid a sense of our own self-enlightenment here! Jeffrey, I agree with you completely about a scooter, or a bike. They both have their place. If I’m going to do 20 miles, it won’t be on a scooter. If I’m doing a few miles, where I want to enjoy the scenery, and stop a lot, then a scoot is the way to go. What would your suggestions in 2018 about pro scooter industry? Or it’s time to move on Electric scooting but I’ve felt the origin of love with pro scooter and its massive tricks too. https://scooterstudy.com/best-pro-scooters-review this article enough to buy or love a pro scooter. What’s your opinion on my question? Thanks for the question. A Pro-Scooter is best if you want to do any kind of jumping or tricks. As a conveyance to get from A to B, the bars are too low, and a street commuter scooter will be more comfortable. Look for the article called Kick-Scooter Classifications on the-vu as that will describe the intended use of each kind. Thanks ”The VU” For replying me and the suggestion. I got it.